Addressing the cost of college tuition is a challenge of politics, educational equality and policy. The risks are high. Rising tuition leads to overwhelming student debt and puts college out of reach for some. But despite the urgency, policy experts do not have the data to propose a definitive state or nationwide response. Panelists at the “Rising Cost of Higher Ed” symposium April 21 at IU Bloomington discussed the pitfalls of current research and the major obstacles in potential policy solutions. Panelists included Jacob Gross, professor of strategic planning in higher education at the University of Louisville; Matt Hawkins, chief operating officer and chief financial officer at the Indiana Commission for Higher Education; Nick Hillman, professor of educational leadership and policy analysis at the University of Wisconsin-Madison; and Phil Schuman, director of financial literacy at IU MoneySmarts. 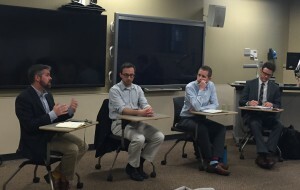 Jacob Gross, left, makes a point, while fellow panelists Nick Hillman, Phil Schuman and Matt Hawkins listen. “From the scholarly angle, we are trying to answer the same question as students: What’s the best way to take out and repay loans?” Hillman said. “But the theme of tonight is going to be how little we know about repayment. “We use a shotgun method to policy-making when in reality, we don’t know what works,” he said. The lack of data on different repayment plans and their effectiveness is only one part of the problem, however. The panelists were pessimistic about what they described as unrealistic plans from presidential candidates. Hawkins pointed to candidate Bernie Sanders’ plan to make tuition free at public universities. The plan relies on state funding, he said, but states continue to reduce funding for higher education. Hawkins was skeptical that a state would fulfill such a large unfunded mandate. “It’s easy to propose impossible remedies,” Hawkins said. Schuman remained optimistic that, at least in Indiana, universities are starting to take the lead to mitigate debt. But even with frozen tuition and financial literacy classes, middle-class students are hit the hardest. Panelists were pessimistic about any policy to address tuition increases in the near future, pointing to the decades-long narrative of a crisis in higher education.